25% more coverage than ordinary oils.long lasting and nongreasy.hypo-allergenic. Item #O-113. 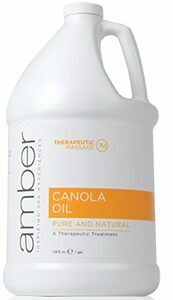 Amber’s Canola Oil is rich in vitamins and minerals. Its high absorption rate makes the oil suitable for all skin types. Gallon Only.“PLEASE NOTE-Gallon Sizes are limited 4 gallons maximum per order in shipment, whether its 4 gallons of the same item or gallons of mixed products throughout the order.If you exceed the maximum of 4 gallons of the same item or mixed products per order, then the order will ship based upon weight of shipment and will have additional shipping charges that will not show up on your internet order but will be additional to your order and appear on your invoice recieved from us.This will overide our “free shipping policy over 99.00 and up. comes in 16oz only.good for all skin types.Contains key ingredients for youthful skin.100% natural grapessed oil. Available in gallon size only.A versatile and powerful anti-oxidant massage oil that is light textured, nourishing and easily absorbed. Suitable for general massage.“PLEASE NOTE-Gallon Sizes are limited 4 gallons maximum per order in shipment, whether its 4 gallons of the same item or gallons of mixed products throughout the order.If you exceed the maximum of 4 gallons of the same item or mixed products per order, then the order will ship based upon weight of shipment and will have additional shipping charges that will not show up on your internet order but will be additional to your order and appear on your invoice recieved from us.This will overide our “free shipping policy over 99.00 and up. Item #O-121. 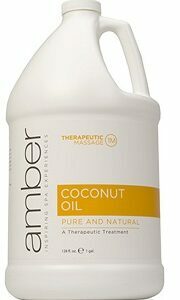 Amber’s Coconut Oil is the most stable of oils that has been used for centuries. This water soluble and odorless oil easily washes out and solidifies. High in natural antioxidants, it is excellent for cracked or brittle skin because it helps retain skin’s moisture. A great natural proctector for sun rays. Gallon Only.“PLEASE NOTE-Gallon Sizes are limited 4 gallons maximum per order in shipment, whether its 4 gallons of the same item or gallons of mixed products throughout the order.If you exceed the maximum of 4 gallons of the same item or mixed products per order, then the order will ship based upon weight of shipment and will have additional shipping charges that will not show up on your internet order but will be additional to your order and appear on your invoice recieved from us.This will overide our “free shipping policy over 99.00 and up. Available in gallon size only.A medium weight formulation that has an easy glide. Increases body warmth and circulation – highly effective for strained muscles, stiff joints and muscle spasms.“PLEASE NOTE-Gallon Sizes are limited 4 gallons maximum per order in shipment, whether its 4 gallons of the same item or gallons of mixed products throughout the order.If you exceed the maximum of 4 gallons of the same item or mixed products per order, then the order will ship based upon weight of shipment and will have additional shipping charges that will not show up on your internet order but will be additional to your order and appear on your invoice recieved from us.This will overide our “free shipping policy over 99.00 and up. 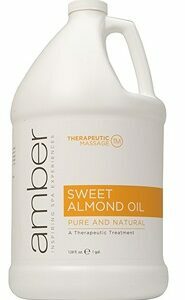 Amber’s Sweet Almond Oil, obtained from the dried kernels of the almond tree, contains high amounts of Vitamin A, B, and E. A powerful antioxidant, sweet almond oil can be used to treat dry or itchy skin. It can also be used as a carrier oil for aromatherapy. Gallon Only.“PLEASE NOTE-Gallon Sizes are limited 4 gallons maximum per order in shipment, whether its 4 gallons of the same item or gallons of mixed products throughout the order.If you exceed the maximum of 4 gallons of the same item or mixed products per order, then the order will ship based upon weight of shipment and will have additional shipping charges that will not show up on your internet order but will be additional to your order and appear on your invoice recieved from us.This will overide our “free shipping policy over 99.00 and up. 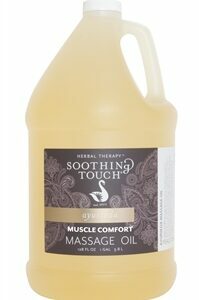 Available in gallon size only.The perfect blend of almond, sunflower, soy bean and safflower oils, this fine textured, easily absorbed massage oil is a non greasy lubricating massage medium. Ideal for adding Signature Blends.“PLEASE NOTE-Gallon Sizes are limited 4 gallons maximum per order in shipment, whether its 4 gallons of the same item or gallons of mixed products throughout the order.If you exceed the maximum of 4 gallons of the same item or mixed products per order, then the order will ship based upon weight of shipment and will have additional shipping charges that will not show up on your internet order but will be additional to your order and appear on your invoice recieved from us.This will overide our “free shipping policy over 99.00 and up. Item #O-105. Nut Free! 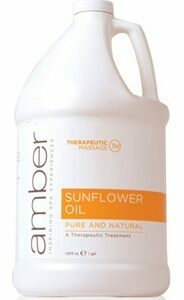 Amber’s Sunflower Oil is a light textured oil that ir rich in vitamin E and oleic acid. Good for all skin types, this oil helps balance the skins moisture by relieving dry and flaky skin. A great emollient and carrier oil. Gallon Only.“PLEASE NOTE-Gallon Sizes are limited 4 gallons maximum per order in shipment, whether its 4 gallons of the same item or gallons of mixed products throughout the order.If you exceed the maximum of 4 gallons of the same item or mixed products per order, then the order will ship based upon weight of shipment and will have additional shipping charges that will not show up on your internet order but will be additional to your order and appear on your invoice recieved from us.This will overide our “free shipping policy over 99.00 and up.